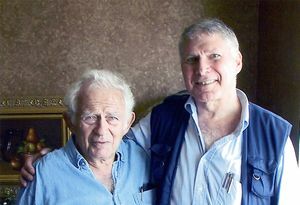 Norman Mailer and Barry Leeds. Barry H. Leeds was an Emeritus Professor of English at Connecticut State University, was one of the co-founders of the Norman Mailer Society, and served as its Vice President since the Society’s founding in 2003. He wrote extensively on the life and works of his good friend, Norman Mailer, including his pioneering study, The Structured Vision of Norman Mailer (1969), and The Enduring Vision of Norman Mailer (2002), and countless essays and reviews. In 2014, he published a candid and moving memoir, A Moveable Beast: Scenes from My Life. He also served on the editorial board of the Mailer Review. His many contributions to understanding Mailer the man and Mailer the artist are one of the pillars of Mailer scholarship. Leeds, Barry H. (2002). The Enduring Vision of Norman Mailer. Bainbridge Island, Wash.: Pleasure Boat Studio. — (1981). Ken Kesey. Modern Literature Series. New York: Ungar Pub Co.
— (2014). A Moveable Beast: Scenes from My Life. London: AuthorHouseUK. — (1969). The Structured Vision of Norman Mailer. New York: NYU Press.